"Tim Perkins is a 24 year old freelance illustrator, who for some years has harboured a dark and shameful obsession: a compulsive desire to enter the world of comics. With the exception of this sad aberration, Mr Perkins seems otherwise to be a remarkably sane and reasonable man. He's a graphic designer, a member of the S.I.A.D. (the Society of Industrial Artists and Designers) and if his pathetic smokescreen of modesty is anything to judge by, has garnered some little reputation for himself in this field. Why, he evens understands huge, unwieldy words like 'Metempsychosis' (which, incidentally, means the migration of a soul from one body to another). The Tim Perkins story has all the ingredients of a classic tear jerker...power, pathos, and a great man brought low by one tragic flaw in his make-up. Below is the actual artwork that Tim has kept hidden for years...He wonders how it got him in the door nowadays...but it did and that's all that matters after all. 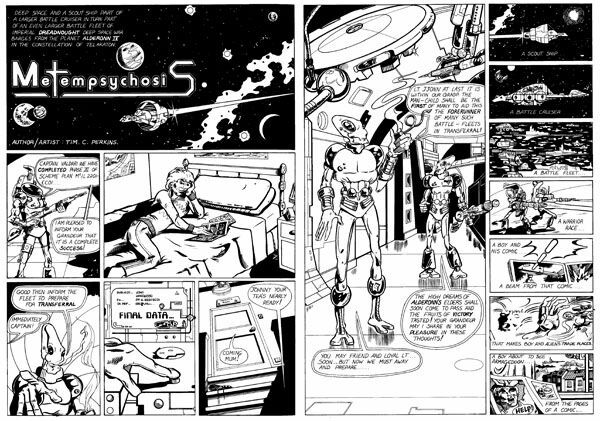 Metempsychosis: Written, Drawn and Lettered by Tim Perkins. The scans are taken from the bromides made from the original artwork in 1983.